Best Chinese Knives: Emerson Super Karambit Clone Knife Review - Budget Tactical EDC Awesomeness! 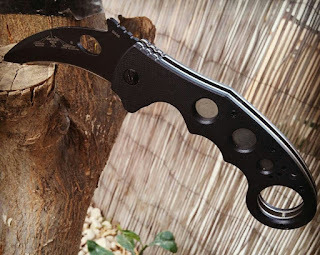 Emerson Super Karambit Clone Knife Review - Budget Tactical EDC Awesomeness! I received this knife a few weeks ago, and I must say I am very impressed! For <$15, it has pretty good fit, finish and overall quality. - Good action out of the box, runs on nylon washers. - Blade is centered, no blade play in any direction, has steel linerlock, which functions great. - Wave feature works well, so does the blade cutout opening. - Came pretty sharp, especially the tip. - Clip, G10, steel liners, hardware - all are fine. - Arrived with some glue on the G10 scales (eventualy came off). - Steel is pretty soft (although for a karambit it's not very important). - Has original Emerson logo on the blade. Overall, a great knife to try the awesome Emerson Karambit design, I liked it very much. BTW - it is possible to dull out the blade and use it as a trainer.